From 1383 until 1385, Portugal found itself in the midst of a period known as the Portuguese interregnum during which there was no reigning legitimate monarch following the death of King Fernando I who was in power from 1367 to 1383. There were several factors leading up to this crisis. After a series of unsuccessful conflicts with the kingdom of Castile, Fernando married his daughter and heir Beatriz to Juan I of Castile. This agreement called for the oldest child of this match to inherit the Portuguese crown with Fernando’s wife Leonor Teles to act as regent. The marriage of Beatriz to the Castilian king caused alarm among the nobility of Portugal as it brought the specter of Castilian rule, a prospect they did not find appealing. When Fernando died in 1383, Beatriz had no children and so Portugal was under the regency of his widow. Leonor surrounded herself with an inner circle of supporters by supplying them with gifts, estates, positions of high office and advantageous marriages. One of these supporters was the Galician João Fernandes Andeiro, Count of Ourém. Andeiro had worked for King Fernando as an ambassador to England for several years and was allegedly Leonor’s lover. Leonor’s effectiveness as regent was undermined by the growing popularity of King Fernando’s illegitimate half-brother João, Master of Avis. João was actively seeking the throne. Leonor was not liked by the people and some of the lesser nobility. Portuguese cities were excluded from the privy council. There were dire economic problems in the country. The administration was forced to devalue the currency several times, leading to widespread discontent. Eventually a revolt, led by João of Avis began. Avis killed Andeiro with his own hand in December 1383 and he drove Leonor from Lisbon into Castile. Assured of the support of the people of Lisbon, Avis assumed the title of defender of the realm. 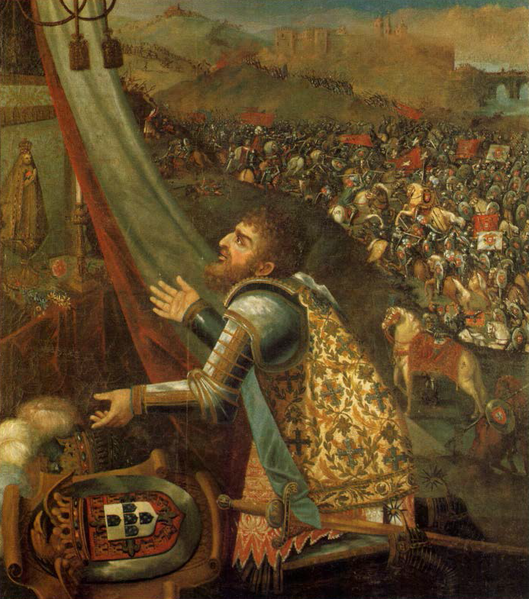 Juan I of Castile came to the aid of Queen Leonor and claimed the throne of Portugal by right of his wife Beatriz and invaded Portugal with his forces, initiating an anti-Castilian reaction. There was now civil war between the Portuguese rebels and the crown of Castile. For the most part, the south and the west backed João of Avis. The coastal and urban areas in particular supported the king of Castile, believing a Castilian government would favor the countryside and the aristocracy. The more traditional and aristocratic north favored Castile also. In the beginning, King Juan I’s campaign in 1384 went well. He kept the forces of Avis on the defensive but he managed to hold on to the central area around Lisbon. Juan besieged the city in April. Castilian ships blockaded the River Tagus and the populace suffered great privation for several months. However, the Castilian campaign in the rest of the country did not go well. An attempt to capture Oporto failed. Nuno Álvares Pereira, one of the greatest Portuguese military leaders, later known as the “Holy Constable”, led a successful campaign in the south. Plague broke out in the Castilian camp and Juan was reluctant to withdraw until Queen Beatriz fell ill and many of his commanders died. He was forced to withdraw his weakened forces and João of Avis was proclaimed King of Portugal by the cortes at Coimbra in early 1385. He elevated Nuno Álvares Pereira to the position of constable. Nuno Álvares was a powerful noble and João could not afford to cross or offend him. The two men went to work on a campaign in the north, taking several legitimist towns. João gave him the dedicated task of intercepting the Castilian troops and prevent them from reaching Lisbon. Juan I returned to Portugal with as many as twenty thousand men and attacked from the north. His army included Portuguese legitimists who opposed King João and a contingent of French men-at-arms which had been supplied by King Charles VI. Juan’s plan was to crush the rebels with sheer force. On April 6, 1385, Nuno Álvares had his first victory with troops on foot against the cavalry of Juan I at Atoleiros. In May, a detachment of troops was returning from a raid and attacked a fortified position held by the Portuguese near Trancoso. The Castilians were routed. Some of Juan’s inexperienced captains convinced him to advance from Cuidad Rodrigo along the main road to Coimbra and Leiria. Nuno Álvares convinced João to attack the Castilian army rather than endure another siege of Lisbon. The Portuguese army numbered about seven to ten thousand strong. They consisted of armed forces of the leading nobles, a ‘feudal host’. These men and their followers could and did operate separately from the crown. The Knights of the Orders provided a reserve of men for the crown. Others included the vassals of the king and soldiers provided by the chartered towns which usually consisted of crossbowmen and mercenary forces. There were also Anglo-Welsh archers and knights who had been recruited by and served John of Gaunt, the English Duke of Lancaster. The Portuguese positioned themselves at Aljubarrota north of Lisbon near Alcobaça, a place specifically chosen for the encounter. The English contingent joined them and the advice of the English regarding tactics was taken into consideration in the army’s preparation for the battle. The army was stationed strategically on a hill where there were streams on either side. The water would protect the flanks of the army and force Juan to attack on a narrow front, invalidating the advantage the Castilians had in superior numbers. On the morning of August 14, Nuno Álvares formed his vanguard facing north with each flank supported by archers and men-at-arms. King João positioned the main body of the infantry behind the vanguard while the baggage was located within a hollow square in the rear. The King of Castile marched his men around the Portuguese position and cut off the Lisbon road behind it. In response, Nuno Álvares moved southward to a position near the hermitage of São Jorge where the conditions were favorable for a defense. Nuno Álvares quickly enhanced the position even further by building a palisade which consisted of a chest-deep open ditches, trenches and a field of covered pits called covas-de-lobo (wolf pits). King Juan was advised to avoid a direct assault and consequently a token effort was made to convince the Portuguese to give up. The younger captains and the exiled Portuguese present in his army urged Juan to attack. The Castilian vanguard of French men-at-arms moved forward, assisted by artillery. Later in the afternoon, some light cavalry harassed the Portuguese baggage train. The Portuguese held their ground as they had the advantage. The Castilian vanguard came to the fore on foot. They were driven into a restricted space causing them to be badly mauled by flanking fire and completely crushed. The main Castilian army then advanced on horseback, later dismounting and fighting on foot. 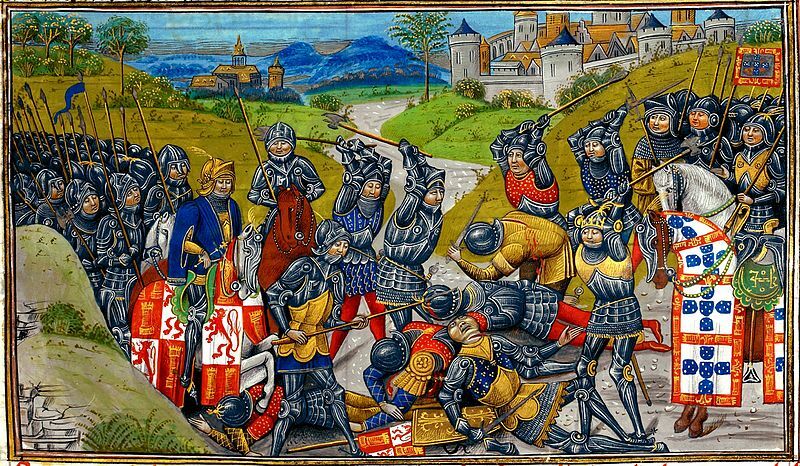 They collided with the Portuguese vanguard where the fighting was extremely intense. They penetrated the Portuguese vanguard. It was at this critical moment that King João compelled the main body of his army forward to repel the enemy. Simultaneously, the wings attacked from the flanks. The covas-de-lobo (wolf pits) were used to great effect. During the enusing melee, the Castilian standard fell and King Juan was forced to flee. His army scattered and twenty-five hundred men-at-arms lay dead in the field. After this resounding defeat, in October, Nuno Álvares had another victory over the Castilians in Valverde near the Guadiana River following a devastating raid he had made in Castilian terrritory. There were lingering border clashes after this but João was in clear control. The large number of the main Portuguese detractors in the Castilian army were slain, a development that would have long term advantageous political consequences for King João. The disastrous campaigns and the bruising defeat at Aljubarrota drained the treasury of Juan I and significantly reduced his influence and effectiveness as king. The battle validated the superiority of the use of the crossbow. The Portuguese army demonstrated more coherence, had better leaders and gained the advantage over superior numbers by being more advanced and modernized at that point in time. João sought allies and sent emissaries to England in search of recruits and to urge John of Gaunt to renew his claim to the Castilian throne. The result was the Treaty of Windsor, the foundation of he long-lasting Anglo-Portuguese alliance. The battle also confirmed João’s status as King of Portugal and the House of Avis as a new dynasty. 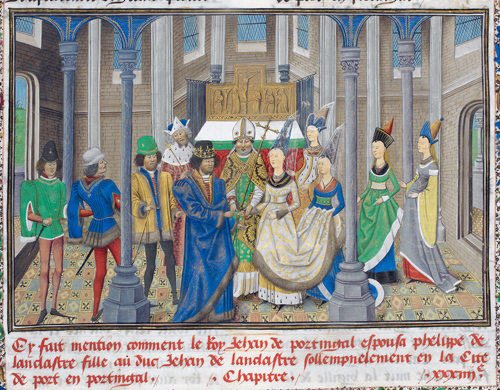 João married John of Gaunt’s daughter Philippa of Lancaster. Their children would be known as the illustrious generation and included Henry the Navigator and their daughter Isabel who became the formidable Duchess of Burgundy. John of Gaunt did raise an army to seek the Castilian throne by right of his wife Constance, daughter of Pedro the Cruel. Gaunt was defeated but the Castilian king no longer had the ability to fight for the Portuguese throne. This moment in history was a turning point for Portugal. It demonstrated the country’s resounding rejection of the idea of a unified Iberian pennisula and represented a defining moment in the advancement of a national consciousness for the Portuguese. Portugal would remain independent of Castile for two centuries. 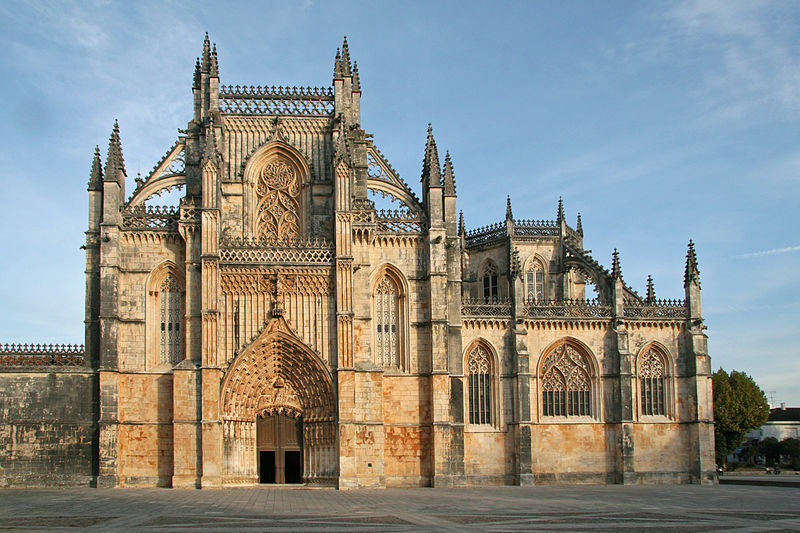 In commemoration of his great victory, King João founded the Monastery of Santa Maria da Vitória, known as Batalha Monastery (Monastery of the Battle). It took over one hundred years to build. The Founders Chapel of the monastery is the first Royal Pantheon built in Portugal and is one of he most important Gothic sites in Portugal. King João, his wife Philippa and all of the illustrious generation but one are buried here.